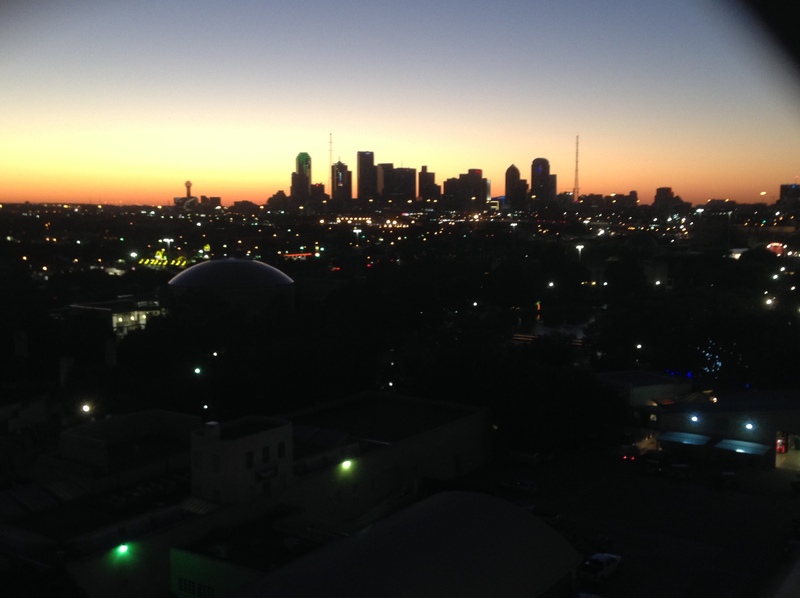 Saturday October 4th was an absolutely gorgeous September day here in Dallas. Clear skies, lovely temperatures in the upper 70’s/low 80’s, and a light breeze. 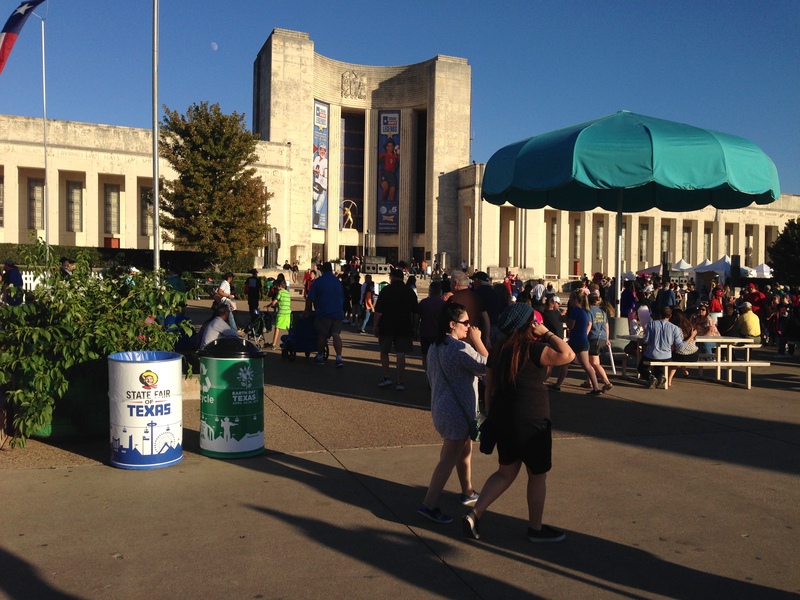 A perfect day to attend the fair at Fair Park. 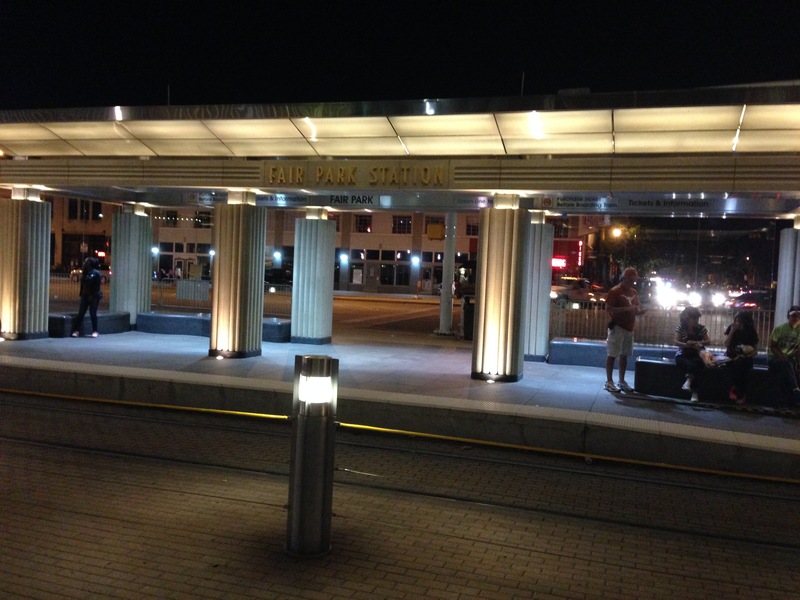 We took DART (Dallas Area Rapid Transit). At $5.00 for a day pass it’s a good deal and the train stops right at the entrance to the fair. Pearl Street Station waiting for the second of our trains to the fair. Tickets at the gate are $17.00 but you can purchase in advance at Kroger for $15.50. It doesn’t seem like much of a savings, but beyond the $1.50, it saved us a very long wait in the line to buy tickets at the entrance. There are long lines for everything so missing this one is a plus. Everyone is scanned with a hand held metal detector at the entrance and purses and backpacks are checked. The next line is to buy coupons. All food items and midway rides are purchased with coupons. They are .50 cents each, sold in pages of 20 for $10.00. You’ll need several more than 1 page depending on how much food and how many rides you indulge. Nothing is cheap at the fair. Our first stop was the auto show. 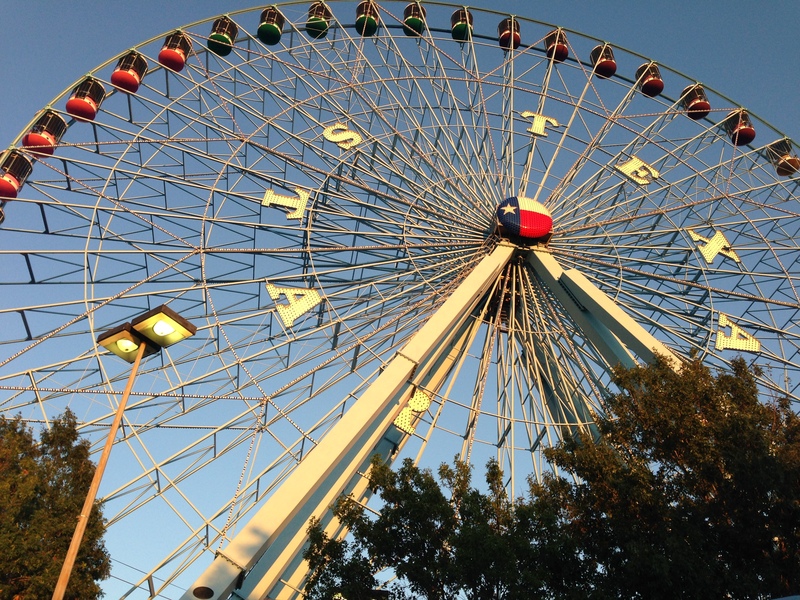 The State Fair of Texas is the only fair in the country to include a full blown auto show, dating back to 1904. It includes over 300,000 square feet of new model vehicles, two buildings, a Truck Zone and a Test Drive Track. Lots of really awesome cars, most of which are way too expensive! Fun to look at, sit in and dream about though. All of my auto show pictures turned out blurry. My iPhone photography skills are apparently not so great! 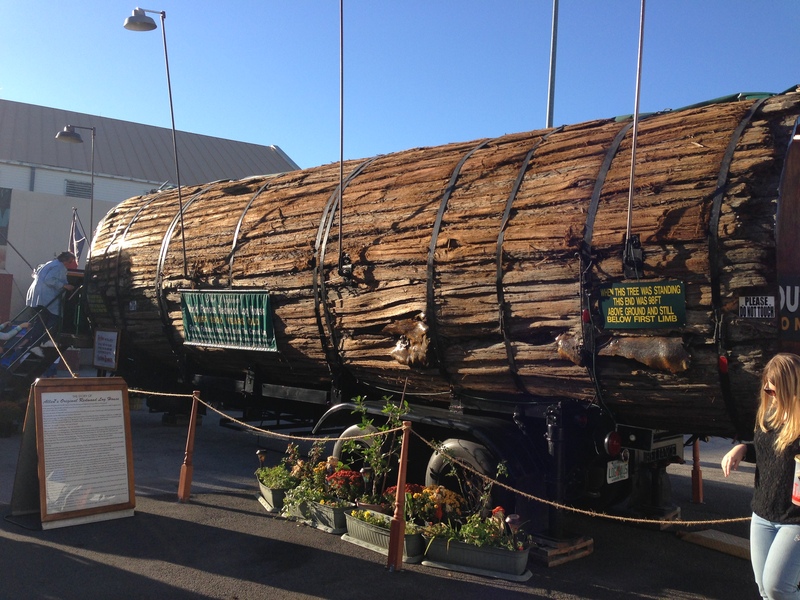 The next stop was a walk through a section of a giant redwood that was hollowed out and turned into a 3 room mini-house. Plenty of headroom, although someone well over 6 feet might need to stoop. It has a bedroom, living room and kitchen. No bathroom so I guess an outhouse was needed. I think mini houses are cool and I really don’t get the concept of one or two people living in giant Mansions or even McMansions, but I’d need a bathroom IN my place, no matter the size. We then walked through a large exhibit area where you can buy everything from handmade wallets, jewelry, and purses to all kinds of art in the form of sketches, paintings, photography, and sculpture. There are some really cool things available to purchase at the fair. Next we wandered about a bit checking out the sights. 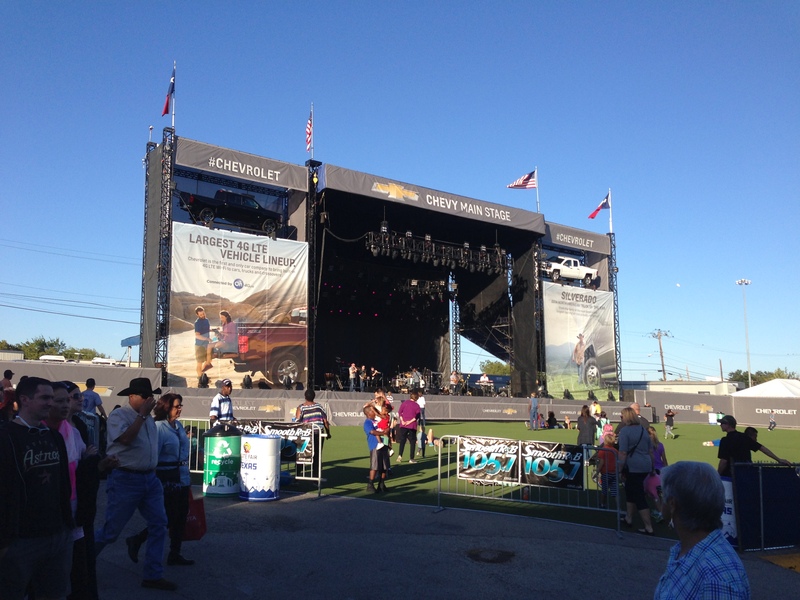 Chevy Main Stage. You could hear the music from this stage quite a ways away. Of course you have to go and check out Big Tex. He is 52 ft. tall and the tallest cowboy in Texas. I’ve personally always found him to be on the creepy side. That said, it was sad when the original burned down a couple of years ago. 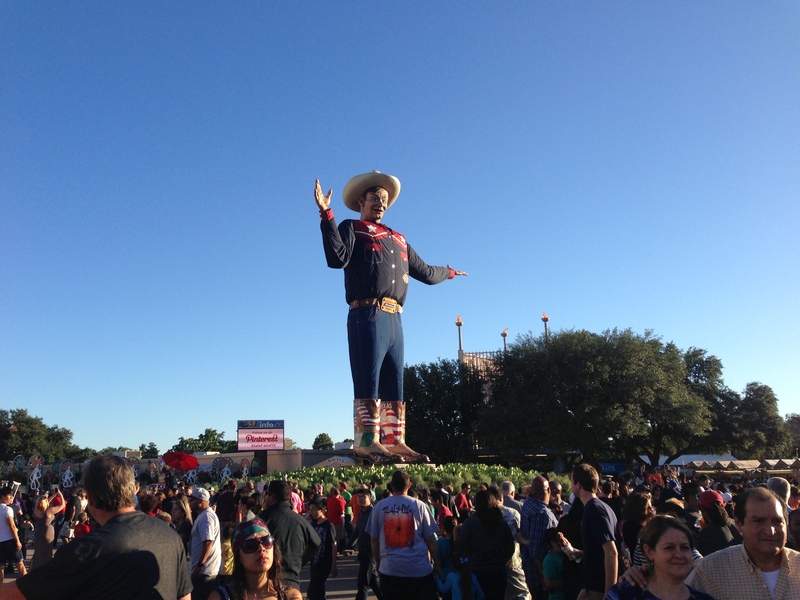 There was some hope on my part that the new Big Tex would be less creepy, but nope. I wanted to go check out all the livestock before those sections closed for the day, (we didn’t go until late afternoon) but I was overruled in favor of the midway. 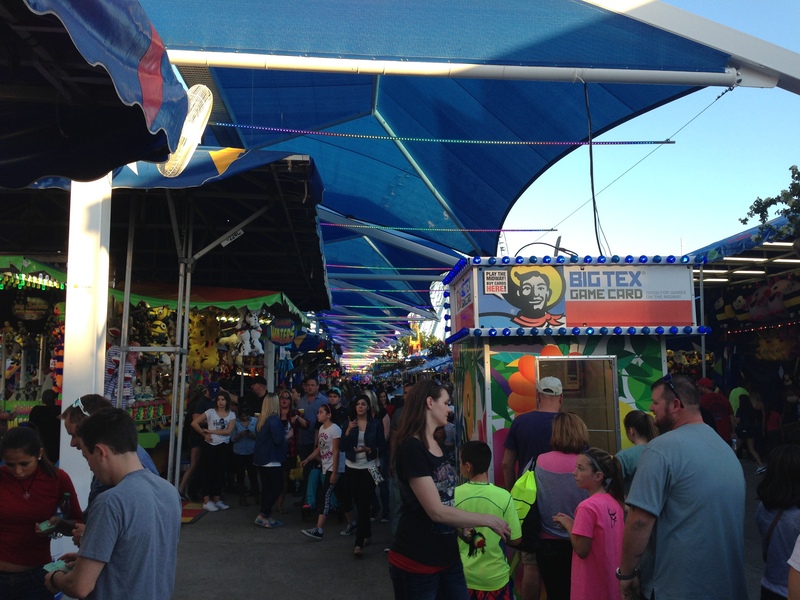 The most crowded and loud part of the fair, though it is fun to walk through and people watch. It is also the place to lose the most money. You can’t use coupons here, you have to buy a card and put money on it. The different games vendors then scan the card to remove the number of “credits” their game charges. It’s an ingenious way to keep you from knowing for sure how much money you’ve spent. Suddenly your card is empty and you’re either done or re-loading it, depending on your level of self control. 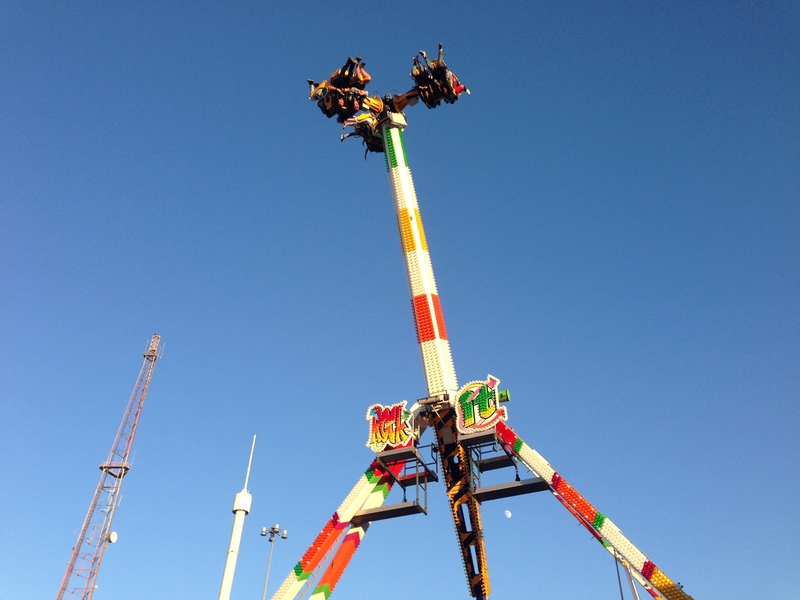 I’m a big fan of roller coasters and some other amusement park rides, but most fair rides I’m just happy to watch. Except for the Texas Star. It is 212 feet tall and the largest ferris wheel in North America. It’s also very popular, so be prepared for a long line. It goes pretty fast though. I think we waited about 30 minutes. The views from the ride are fantastic and I took a lot of photos. Which were all blurry. The one below isn’t too bad though. Our next stop was the Illumination Sensation light show on the Esplanade. Lots of patriotic music, lasers, jets of flames leaping up at random times and fireworks. I took tons of very blurry pictures that I won’t subject you to. No trip to the State Fair is complete without a discussion of the food. There is so much to choose from that it is almost impossible to make decisions. Our crew ate corn on the cob (hot and buttery), sausage on a stick, chili pie, fries w/queso and bacon, hot dogs, funnel cakes and chocolate and pineapple waffle cones (both flavors were delicious). We tried the frozen margarita’s and strawberry daiquiri’s. The margarita was gross, the daiquiri just ok. Those are just a fraction of the food and beverage choices available and more than 200 locations across the fair serve food, so you are never far from something that smells delicious. We kept talking about stopping for a Fletcher’s corny dog, but never got around to it. It’s weird, I never think to take pictures of the food I’m about to eat, so no photos, blurry or otherwise. 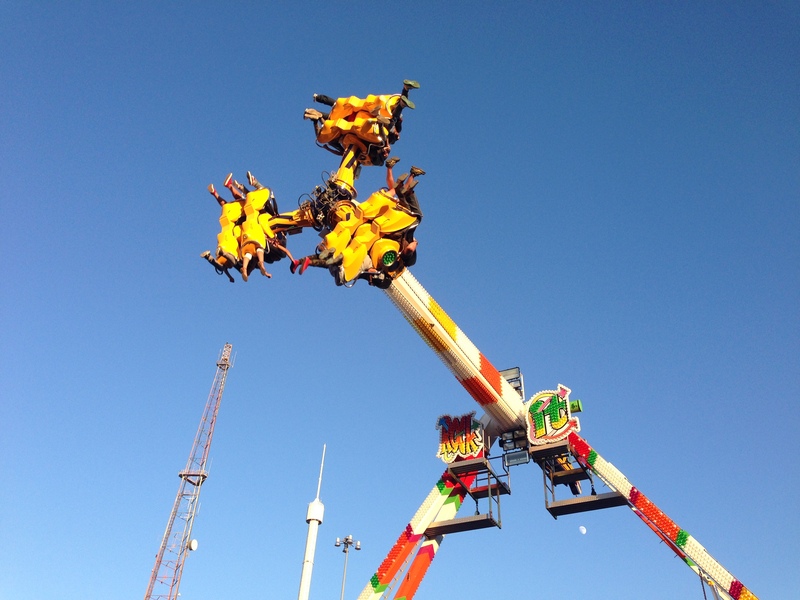 The State Fair of Texas offers more than 70 amusement rides and 370,000 square feet of exhibits, so there is no possible way to see even close to everything in one trip. And by this point we were footsore and ready to head home. 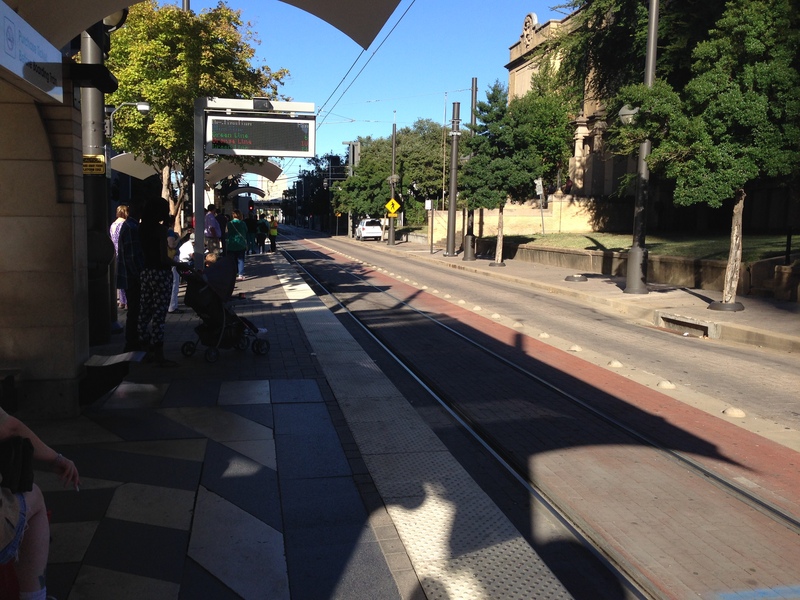 So off to the train station we went. 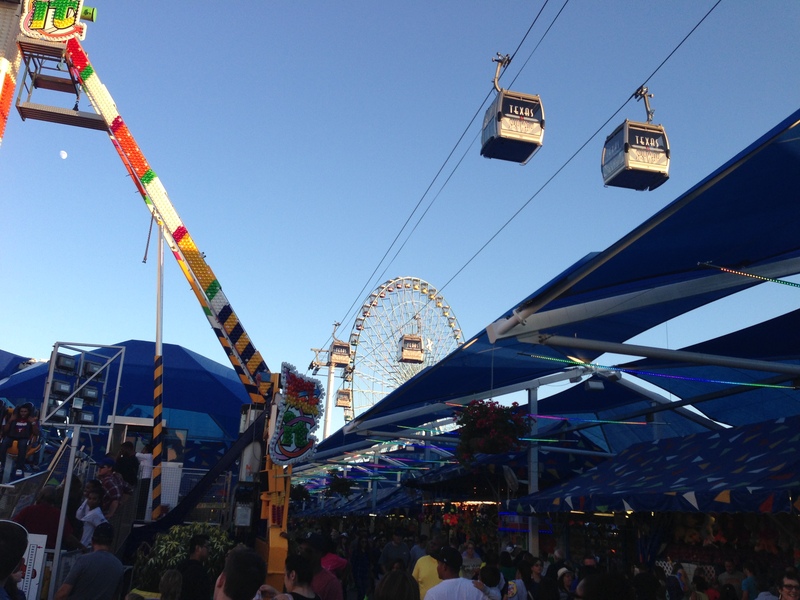 Of course, it was nearly 9:00 pm and the fair closes at 10:00, so lots of other people had the same idea. We waited for 20 minutes for the next train and even though we were close to the tracks, people made made dashes for the doors and we barely made it on that train. And then we were packed like sardines, standing in the aisles for the first leg of the trip home. Something to consider if you do take DART. The second train was not nearly as crowded and we were able to sit and relax on the rest of the ride home. 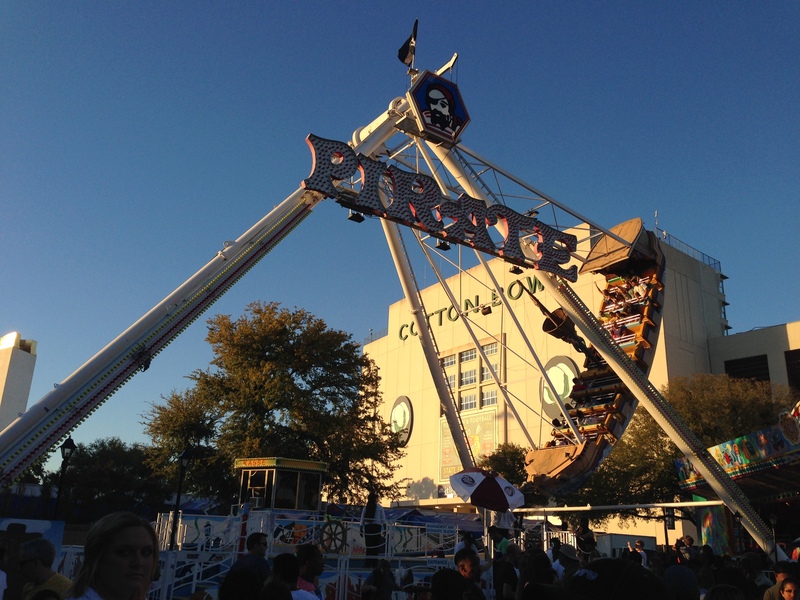 The Texas State Fair has taken place every year since 1886 except for varying periods during World War I and World War II, and pumps more than $350 million into the Dallas economy during its 24 day run each year. Security was very visible, but un-intrusive. It was extremely crowded, but everyone was well behaved and I never felt unsafe. It is definitely worth a trip if you are in Dallas between late September and late October. Just make sure you have on comfy shoes and your wallet is full!